The European Parliament today voted in favour of its own mandate for the negotiations of the Transatlantic Trade and Investment Partnership, a broad free trade agreement between its 28 member states and the United States. With 436 yes versus 241 no votes (32 abstentions), the Parliament adopted a resolution that also gives green light to the hotly debated investor-state dispute settlement (ISDS), albeit a new version of it. While the Parliament’s “mandate” is not binding for Trade Commissioner Cecilia Malmstroem, the Parliament has the final say over the agreement. Lange said he did not expect the final vote on the negotiated agreement before 2018 or 2019. ISDS has been the most contentious single topic of the resolution, even splitting party groups. 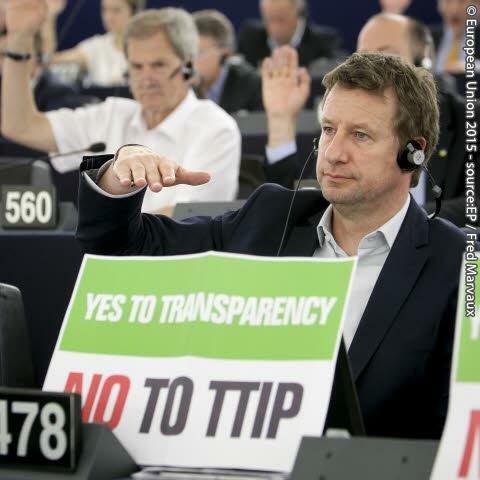 Some members of the conservative European People’s Party Group (EPP) and the Socialists and Democrats (S&D) joined the Green and Left Party groups in asking to exempt ISDS from the negotiations completely. Parliament President Martin Schulz in the end just put Lange’s version to the vote, after a heated debate over procedure with Green Party members, allowing it to be passed by the majority. Activist and consumer groups called the vote, and especially the ISDS decision, “extremely disappointing” (Corporate Europe Observatory) or just “a blunder” (FFII). European Digital Rights welcomed several requests made in the resolution, yet at the same time saw it fall short on redlines established by the organisation, namely, clarifying the priority of human rights, exempting copyright, trademark and patents from the negotiations, or keeping encryption standards out. Some 97 percent of 150,000 EU citizens surveyed rejected ISDS in an official EU consultation in 2014. And 2.3 million people meanwhile signed a petition to halt the negotiations altogether. Several members of Parliament, including conservative Viviane Reding and Liberal Marietje Schaake, welcomed the vote in short releases, while noting that this was only an intermediary step and not final approval of the agreement. Lange said that the old ISDS had been “thrown to the dustbin of history” and that the Parliament had expressed their clear demands on negotiators with regard to clear reservations on the cultural industry, public services and strict data protection. "European Parliament Decides In Favour Of TTIP Mandate And “New ISDS”" by Intellectual Property Watch is licensed under a Creative Commons Attribution-NonCommercial-ShareAlike 4.0 International License.